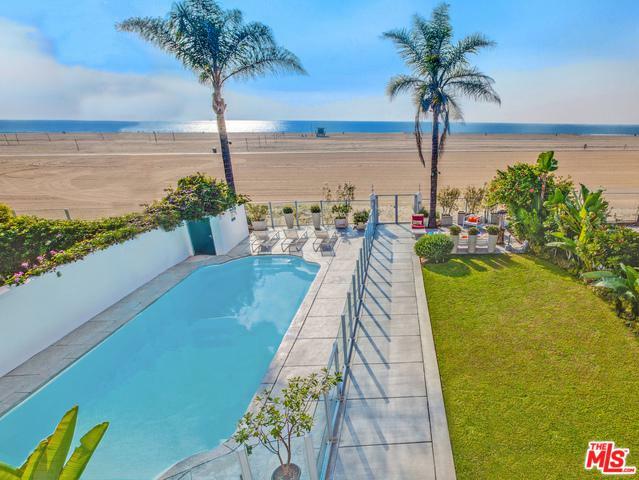 A rare Santa Monica beachfront estate with sweeping panoramic views that span from Palos Verdes to Malibu. This Spanish Colonial Revival is prominently situated on the legendary Gold Coast. The property features classic elements with what one would expect from today's modern luxury living. Enter this elegant sanctuary through a courtyard, high ceilings throughout adorn generously sized living spaces. The master suite enraptures breathtaking ocean views, a huge master bath, and walk-in closets. Three kitchens and a separate guest house accommodate hosting guests or staff. Private 6-car underground parking garage. Large private pool and grassy backyard are just footsteps from the sand. Nearby the famous Santa Monica Pier, Third Street Promenade, Santa Monica Place, farmer's market, world-class restaurants, shopping, and entertainment. Listing provided courtesy of Aitan Segal of Berkshire Hathaway Homeservices California. ©2019 California Desert Association of Realtors. All rights reserved. IDX information is provided exclusively for consumers' personal, non-commercial use and may not be used for any purpose other than to identify prospective properties consumers may be interested in purchasing. Information is deemed reliable but is not guaranteed accurate by the MLS or The Sandi Phillips Team | HK Lane. Based on information from the California Desert Association of Realtors as of 2019-04-22T08:36:08.207. All data, including all measurements and calculations of area, is obtained from various sources and has not been, and will not be, verified by broker of MLS. All information should be independently reviewed and verified for accuracy. Properties may or may not be listing by the office/agent presenting the information.